The agriculture sector is of paramount importance to the Ecuadorian economy. In 2017, it accounted for 9.3% of the country’s GDP, 43.8% of national exports, 26.1% of formal employment and 20.3% of total FDI flow. The sector was also one of the largest foreign exchange generators, recording steady trade surpluses reaching a record high of USD 7.6bn in 2017. Moreover, agriculture was among the main drivers of economic growth, expanding its gross value added (GVA) at a strong CAGR of 4.7% over 2012-2017, well above overall GDP growth over the same period (CAGR of 2%). The country’s agriculture is highly skewed towards the production of bananas and shrimp, which accounted for 72.2% of the sector’s exports and 31.9% of national exports. On the other hand, Ecuador relies on imports of cereals and livestock products to meet domestic demand. 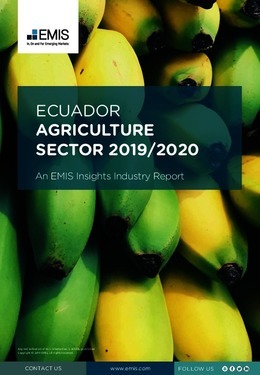 This report provides a complete and detailed analysis of the agriculture sector for Ecuador. EMIS Insights presents in-depth business intelligence in a standard format across countries and regions, providing a balanced mix between analysis and data. Build a clear picture of trends, production and consumption for specific sub-sectors (e.g. grains, vegetables and livestock farming).